Wheelchair riders understandably get upset when people say they are "wheelchair confined." Nobody, they say, calls a bike rider "bicycle confined." For someone who cannot walk, a good wheelchair can be a doorway to freedom. It is liberating, not confining. But if assistive devices - including wheelchairs - are to help disabled persons reach their potential, they must be carefully selected, designed, and adapted to meet each individual's unique combination of needs. In this book's Introduction we saw how standard wheelchairs from the North, donated to 4 women in different countries and circumstances, proved unsatisfactory. This was because the providers did not take into account the particular needs and wishes of each individual. Nor did they consider cultural factors, living conditions, local terrain, available transport, or questions of accessibility. By contrast, we saw much better results when such factors were taken into account, and when needs and possibilities were discussed with the disabled person and family as part of a creative, problem-solving approach. Even when persons with the same disability live in the same town, their needs for equipment may vary, depending on their lifestyle, options for schooling or work, and other factors. Cost and convenience must also be considered. For example, before the wheelchair builders at PROJIMO make a chair for a person, they ask if the chair will need to be transported in a motor vehicle, and if so, what kind. To fit into a passenger car, it helps if the chair can be folded. But, if the chair will be carried in the back of a truck, folding may be less important. For many families, keeping the price down may seem more essential. A non-folding chair can be made at lower cost, is lighter weight, and is often more trouble free. In this part of the book we look at the needs of different persons, not only for wheelchairs, but also for other equipment in the realm of "wheeled mobility." This includeswheeled cots, (gurneys, trollies) and hand-powered tricycles. Our emphasis is on development of a particular mobility aid to meet the specific needs, circumstances, and possibilities of an individual user. For this reason we often describe the situation in story form, and may sometimes include the development of other innovations for the same person. Wheels work for getting around only when there is access to where you want to go. This means everything from sufficiently smooth, firmwalkways and roads, to ramps and in some cases lifts or elevators. In Chapter 35 we describe a low cost elevator with gravity lift. In this book we do not include detailed instructions on design and production of standard wheelchairs. Four very different wheelchair designs are in the book, Disabled Village Children. Details for building the excellent, low-cost Whirlwind Wheelchair are found in Independence Through Mobility, by Ralf Hotchkiss (see p.343). Here we do, however, include some of the most recent breakthroughs in the Whirlwind design (in Chapter 30). One day, two persons from PROJIMO visited the home of a disabled child in the city of Mazatlán. The child's mother told them about a neighboring family with two children who could not walk. "They're smart little kids," she said, "but their bodies are too weak to walk." Together, the mother and the PROJIMO workers went to visit these neighbors. They found the two children alone in the house with a baby sitter. The sitter was friendly and invited the visitors to examine the children, who were playing on the floor. It appeared that the children had an inherited muscle weakness, perhaps some form of muscular dystrophy. MARCOS, the older child, was six years old. He pointed proudly to a big wheelchair in the corner. "Put me in my car!" he insisted. 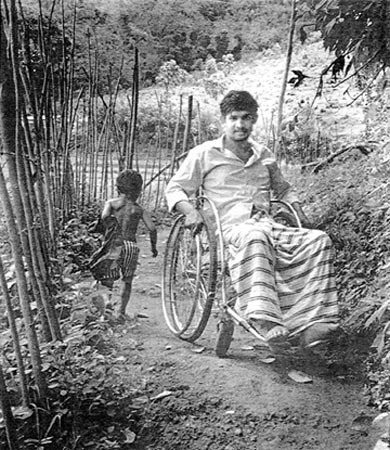 The wheelchair, donated by a government family aid program, was adult size. The small boy sat in it with his feet sticking out over the front edge of the seat. He tried to move the chair by pushing on the wheel rims, but had to stretch his arms far apart to reach them. The chair was so heavy, he could barely move it. "We have a small, light wheelchair in Ajoya that should fit him much better," said one PROJIMO worker. "We will bring it on our next trip." And so they did. The chair fit Marcos well. Although his arms were quite weak, he could move it about slowly in places where the ground was level and fairly smooth. On this visit the children's mother was home. The PROJIMO workers suggested that she trade the big chair for the small one. But she insisted on keeping the big one. The PROJIMO workers explained all the reasons why the small chair was more appropriate: "Marcos sits in a better position. He can move it by himself. It is lighter and takes up less space. And, because the seat is lower, with practice he may learn to climb into and out of it by himself." The children's mother listened politely, then said, "But you don't understand! For us, the big chair is best. You see, I don't have a husband. I sell tacos in the street market. Often I don't have any money to pay a baby sitter. So I have to take both children with me to the market. In the big chair I can seat both of them together!" That was something the PROJIMO workers had not thought of. Given the circumstances, the big chair meets the family's needs better than the small chair. From this experience, the PROJIMO workers learned the importance of including the family - from the beginning - in the problem-solving process. They yielded to the mother's choice of the over-sized chair. But Marcos was unhappy. He had fallen in love with the small chair, which he could move around by himself. It would be hard to take the small chair back, once the boy had tried it. In the end, the team made a costly but caring decision. The family kept both chairs. Marcos was, of course, delighted. Often a simple device can make as big a difference as a more complex one. And if the device is simple, the user can understand, make, adapt, and control it more easily. Mike Miles, a perceptive observer who worked in community-based rehabilitation in Pakistan for many years, tells a thought-provoking story, which I paraphrase below. WHICH IS MORE APPROPRIATE? ... WHO IS MORE INDEPENDENT? One time, in Europe, a man with paralyzed legs wanted to mail a registered letter at the Post Office. He drove his specially adapted van to the city center and parked in a disabled-parking spot near the Post Office. Using his van's motorized lift, he lowered himself in his wheelchair to the street. In his battery-powered wheelchair he zoomed to the front of the Post Office, only to discover that there were three steps he must go up to get inside. Unlike most Post Offices in Europe, there was no ramp! Cursing the insensitivity and unfairness of society, he turned his wheelchair around, roared back to his van, hoisted himself and his chair up into it on the lift, and angrily drove home - his letter unmailed. At the same time, in far-away Pakistan, another man who also had both legs paralyzed wanted to mail a letter at the local Post Office. He hopped on his small skate-board and pushed himself quickly along the narrow streets. He hitched a ride by holding onto the back of a horse-drawn cart. At last he reached the Post Office. To enter it, there were 10 steps and no ramp No worry! He scooted off the skate-board onto the first step. 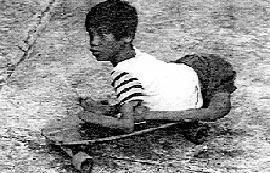 With his arms, he lifted himself on his backside from one step to the next, dragging his skate-board with him. When he reached the top step, he hopped back on his skate-board, rolled to the counter, and handed the letter up to the postal clerk. Thanking him, he turned around, rolled back to the steps, scooted down them on his backside, and rode his skate-board home - his mission fulfilled. "Which of these 2 men is more independent?" asks Mike. "Which of the mobility aids is more appropriate? Which society is more at ease with disability?" ... Clearly, the answers depend on the local situation, cultural faotors, and the view point of the persons involved (as well as your own). 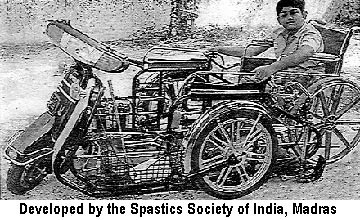 This motorcycle with two back wheels has been adapted with a ramp at the back so that the wheelchair rider can wheel up into it and drive while seated in his wheelchair.